Barre and fitness related articles. Many of us have sought nutritional guidance and education from a Registered and Licensed Dietitian. Equipped with their support and instruction, we are better prepared to make healthy food choices that positively influence and improve our wellbeing. Whether you have attended a nutrition seminar hosted by a RDN, or have met with an RDN for a personal consultation, chances are you have asked yourself, “I wonder what my RDN eats on a typical day?” To find the answer to that question, we went straight to the source and interviewed our RDN, Michelle Konstantarakis. Although Michelle’s typical daily consumption is not representative of all Registered and Licensed Dietitians, we feel it provides a solid outline and great source of inspiration as to several healthy meal choices and ideas. 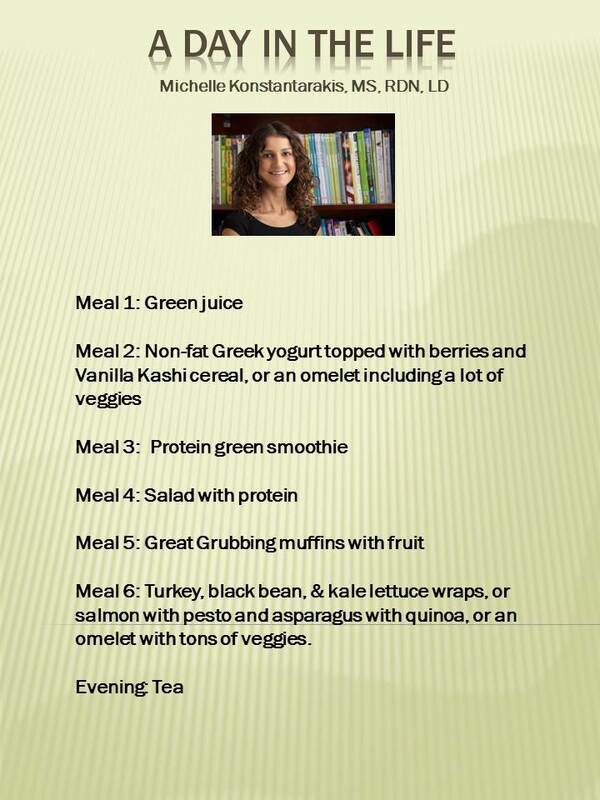 See the chart below to view what Michelle consumes within the framework of 6 meals in a typical day.